I love Gujarati snacks for the fact that most of them are low calorie recipes. 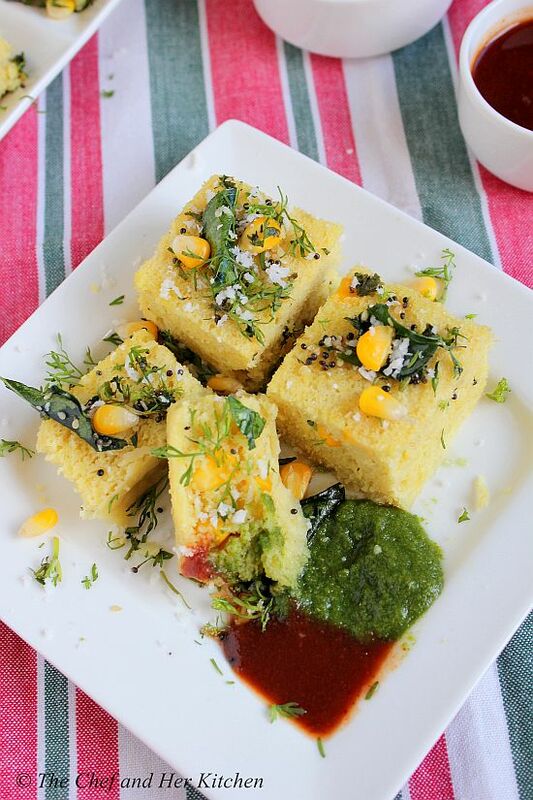 Dhokla falls under that category.There are many versions of Dhokla like Khaman Dhokla, Khatta Dhokla, Sooji Dhokla, Moong dal Dhokla, Corn dhokla, Sandwich Dhokla, Palak Dhokla etc and I absolutely love all the versions.The most common one is Khaman Dhokla which I would like to post it some time later. 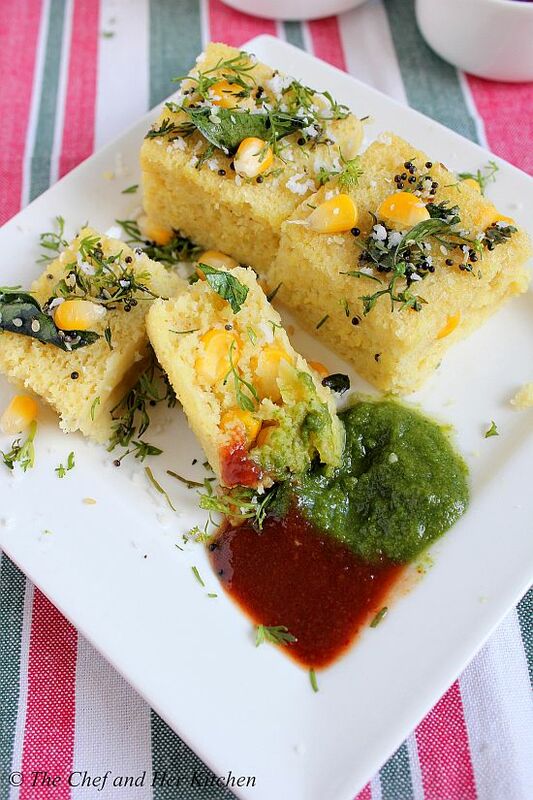 Moong dal Corn Dhokla is also known as 'Mexican Dhokla', though I am not sure why it is given that name. Usually in Mexican Dhokla, a layer of potato slices are arranged on the batter and is steamed together which adds a nice look to the Dhokla and is a nice variation from the regular one.I have not added potato slices to it as I was in a hurry as I prepared this for DH's breakfast box.The addition of corn adds a slight hint of sweetness and also a bite in between as we add the whole corn kernels in the batter.If you are looking for healthy options for Kid's Tiffin box, I would definitely suggest you to try this once as it is a healthy and protein packed snack. Wash and soak moong dal for 2-3 hrs.Rinse and drain the excess water. Grind soaked moong dal with 1/3 cup corn kernels, ginger and green chillies to a fine batter. Take the mixture into a bowl and add besan(chickpea flour), rest of corn kernels(roughly 2 tbsp), sugar, beaten curd, citric acid crystals, turmeric powder, salt, sugar and oil and mix nicely.The batter consistency would be some what similar to idli batter. Just before steaming add eno to it and mix nicely.The batter would be frothy.Immediately pour into a greased flat steel vessel or dhokla container to 1 inch thickness and steam it for 12-15 mins after the steam starts coming out.I use my pressure cooker to steam it and I remove the whistle from it. 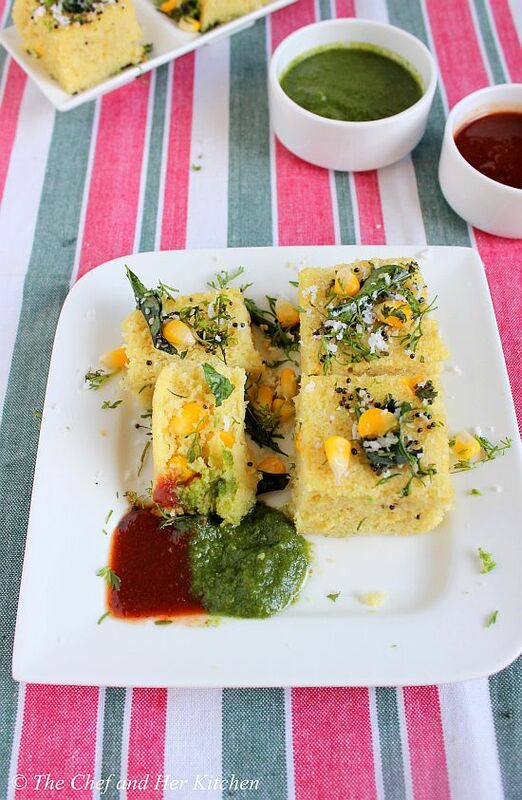 Cool it a bit and run a sharp knife in the edges and carefully unmold the dhokla into a plate. Heat oil in a small tempering pan and crackle mustard seeds and sesame seeds. Add green chillies, curry leaves and asafoetida and fry until the chillies wilt and spread the seasoning all over the dhokla.Garnish with grated coconut and chopped coriander leaves. Cut it into squares or triangles of required size. Serve it with Green Chutney and Meetha Chutney. You can avoid corn kernels in the recipe and make it with just moong dal. Increase the dal quantity to 1 cup in that case. 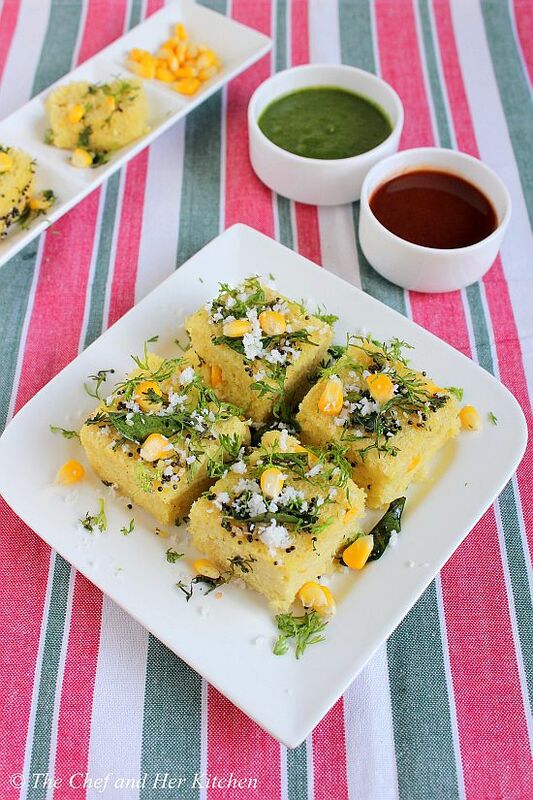 If you want you can arrange a layer of thinly sliced potato slices on the batter before steaming.It is called Mexican Dhokla if prepared in this way. Looks yummy! Any substitue for citric acid crystals? Nice recipe..looks delicious..am going to try this sometime..
we need to cook the corn before grinding it? wow so good this is really stunning so good. 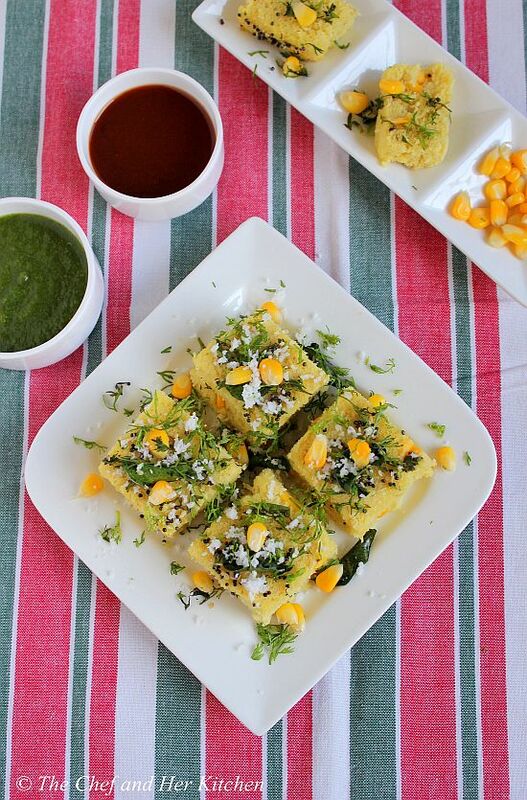 Yummy & healthy dhoklas ! a healthy dhokla and a yummy snack too. IT APPEARS TO ME THE BEST VARIETY OF DOKLA ,DELICIOUS AND MOUTH WATERING. Smita...mine is 1cup = 200gms.. I made this dhokla a couple of days back and they came out good. I made few changes in the recipe, like I ground just 1 green chilly instead of 2 and after the dhokla was steamed and ready I poured some warm water in which I mixed some salt and sugar, thereby making them moist . I was happy with the overall result. 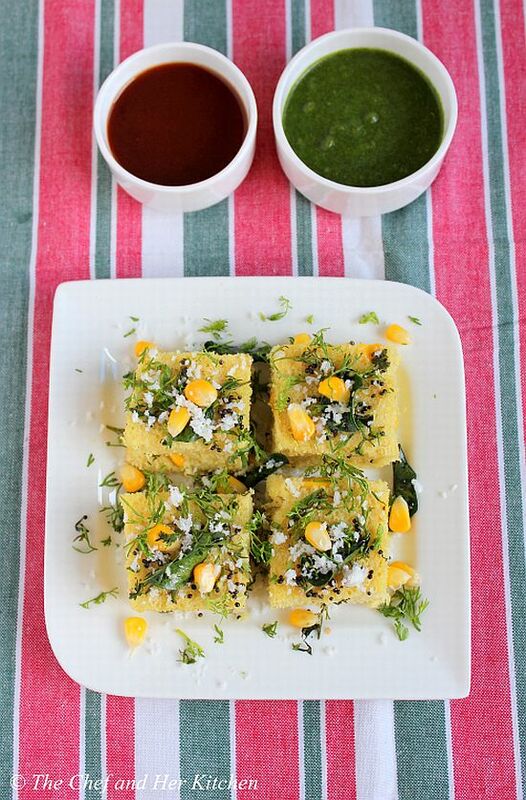 This is definitely a healthier version compared to the traditional besan dhokla . Thank you. @Ashwini...I usually add the warm water for regular besan dhokla to keep it soft and moist..yes it is a very healthy version and I am glad you liked it.. Tried the recipe of dhoklas today...must say came out amazing...thanks for sharing such a wonderful recipe.. Instead of citrus soda i added cooking soda and it also turned out well.. I think the batter was very thick that's the reason it might b dry..You can add 1/4 cup of water to the tadka along with 1 tsp of sugar and some salt and pour the mixture hot on thedhokla..It would make the dhokla moist n soft..I hope this helps! !